With a range of striking natural patterns available from marble stone, marble countertops can fit in well with a wide range of room styles. Marble is a popular choice for both kitchen and bathroom countertops, but it has a few downsides. Read on to find out more about marble countertops and decide whether or not they are right for you. Appearance – The main reason people opt for marble countertops is for the striking appearance of the stone. It has a traditional, elegant look that can really complement the style of a room. It might not be your top choice if you’re going for a more modern style, however. Each piece of marble is completely one of a kind with a variety of tones and unique veining patterns. Heat resistant – Marble is no stranger to markings, but one thing it can withstand is heat. So, you’d be fine placing a hot pan on your kitchen countertops or leaving a curling iron by your kitchen sink as it cools down. Cool surface – Marble provides a nice cool surface. So, if you’re fond of baking, it makes a great surface for working with pastry on. 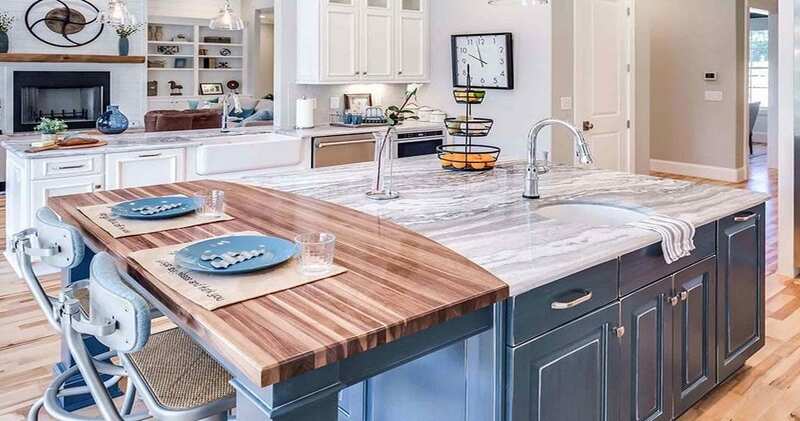 Easy to stain – Marble probably isn’t the best stone to choose for your countertops if you are particularly obsessive about keeping them in pristine condition. Marble is a porous material, making it extremely easy to stain if you spill on it, especially with acidic liquids or foods. This can leave your countertops with permanent water-marks and other etches. Getting your marble properly sealed helps to fight the likelihood of staining, but this will need redoing on a regular basis. Not scratch resistant – As well as staining, marble is also prone to scratches. One wrong move with a sharp knife or a heavy pan can lead to deep chips or scratches on your countertop surface. However, these stains, scratches, and etches that come from everyday wear and tear often blend into the veining pattern of the marble and can even add more character to your countertops. So, if you don’t mind your countertops showing evidence of wear and tear, or if you’re willing and able to keep them pristine, then marble countertops are a great choice to give your kitchen or bathroom an elegant, timeless feel to them. If you do go for marble countertops, these care and maintenance tips will help you keep them in good shape. If you’re looking for marble countertops and installation services, get in touch with Amanzi Granite. We proudly service the Triad area, including Winston Salem, Greensboro, High Point, and Kernersville. If you’re still not sure, then read the thoughts of someone who had marble countertops installed in their home.